On 9/27/07 we tasted the wine again and had a few observations. Q4 was our favorite, good balance, most fruit, carmel in nose. SG4 had less fruit and was hotter with a little bitterness on the finish. WC6 no comment, Q3 was somewhat more astringent than the others. In general we thought it was ready for bottling but, could use more aging in the bottle to soften up the tannins. 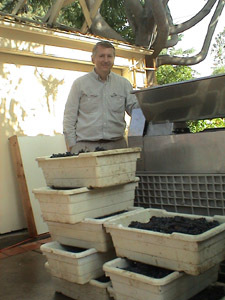 On 11/21/06 The wine was sampled and analyzed again at the same time the 2006 was analyzed post pressing. Here are the results which are somewhat different from the prior testing. They are also more complete. Although 2005 produced larger grapes there is little sign of reduced intensity in this wine. It could easily be diluted to bring the alcohol levels down. I would recommend a 3% dilution to bring the levels down from 15.1% to 14.7%. This dilution will produce about 2 cases of extra topping wine. Acidities should be brought up some to the 5.5 range on Q3 and Q4 also. We are scheduled to have a tasting on 11/29 to address these questions. WC5(2003) 6.3g/l 3.66pH .3% 14.4% Dill Pickle nose, cooked veg in taste, but balance perfect, Still improving, not overoaked, should aerate and let sit another year. Not ready to dump. This was racked to a tank back in my garage and half was bottled while the other half was eventually dumped. My first truly bad wine in quantity. Q4 4.9 g/l 3.86 Harmony Yeast Lots of CO2 yet. Harmony yeast wine had lower T.A. by about 10%. T.A.s dropped about 1 g/liter since settling in the tanks. M.L. was responsible for some of this reduction. pH's are reasonable but a little high. Need to taste and probably add acid. On 2/4/06 Jeff and Diane hosted our first blind tasting of the 2005 vintage. Here are the scores. 2. +11 2004 Wine Coop Blend of two barrels by Gary. Below is the Malo- Lactic chromatograph. You can see that the M.L. fermentation was partially complete for most of the tanks but least so for the smaller tank H and very little for the Carmenere on the left and the Merlot on the right. The way to read this is to look for the Malic acid spot for each sample. The Malic acid spots are at the height shown by the spot over the pure Malic sample labeled M. The T and L spots are for tartaric and lactic acid respectively. You can see the tartaric spot at the bottom, Malic in the middle and the Lactic up at the top. On 1/7/06 the wine was racked off the lies in tanks in Mark's garage to barrels in Tim's basement. Four full barrels were filled and 14 bottles of topping wine was left over for a total yield of 240.7 gallons after starting with 261.3 gallons. Yield was 92%. Actual wine to lies ratio was more like 95% but some wine was lost to hoses and winemakers. Tim, Glista, Mike J. Mike O. Mike H. Jeff, George, Mark and Cindy participated. John and James, Tim's sons also helped out. The wine is tasting quite good according to consensus but, it still has a lot of CO2 so it is impossible to judge the mouth feel very well. Noble Yeast - Tank A to Barrel WC6, French Oak, Mendocino Oak Medium Toast used once for 2003 vintage. Harmony Yeast - Tank E to Barrel Q4, French Oak, Quintessance Medium Toast+, New Barrel Top 1/3 of E actually went into Q3 and much of tank H which was also Harmony yeast went into Q4. 1/6/05 M.L. chromatograph done. results not yet available. 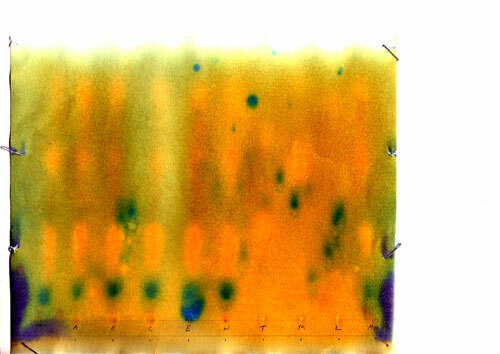 On 11/2/05 The wine was analyzed with the results below. The adjustments were successful at getting the alcohol level under 15% in almost all cases and the acidity into the 6s. pH is a little high but, this is characteristic of Napa Valley grapes. The samples were pumped down and tasted. They were all clean with no hints of green pepper or vegetables. The grapes were definitely more ripe than the 03 and 04 as desired. This wine is right on target and in good shape. I thought I noticed a little more fruitiness for the Harmony yeast splits but, it was not clear consistently. I innoculated the wine with Malo-Lactic bacteria and added associated nutrients. 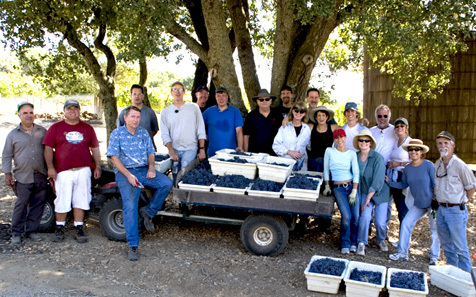 On 10/29/05 5 members pressed tanks A, C and E of the wine and on 10/30 the other 7 members showed up to press tanks B, D, F and G. We got 261 gallons of wine from 336 gallons of must for a yield of .776 which is quite a bit higher than last year's .67 average for the Rubissow grapes. The extra wine will allow us to fill 4 full barrels rather than 3 1/2. Below is the fermentation graph for the wine to 10/12 at 11:00am. Fermentation is essentially done for the Harmony Yeast batches while the Noble yeast batches still have about 12% to go. We are switching to a once a day punchdown just for the standard yeast batches. The Harmony yeast batches won't be punched any more. At the end of picking the Grapes. This big crew had the job done by 11:00am. Picked Blocks 3 and 4 down to row 61. Total weight picked 3350 lbs. Total must volume pre dilution = 320 gal. Total Must Volume Post Dilution = 336 gal. The lower block 5 where the grapes for the coop came from was very low in nitrogen and should have had more nutrients added however, the levels we added were sufficient to prevent the production of any sulfides. Since the nutrients were likely fully consumed there is likely no taste contribution from the nutrients which can happen if excess nutrients are used. As always our goal is to make top notch Napa hillside Cabernet Sauvignon. We want to consistently beat $50 bottles of commercial Napa cabs in blind tastings as our 2002 Wine coop wine from barrel WC5 has done. Make one barrel of wine with very ripe fruit. We tasted and liked the wine from the 27 Brix grapes from the young French clones picked in 2004. Water back and add acid to the wine fairly aggressively in this scenario. Use a single yeast. Some of the grapes will be ripe enough to do this. 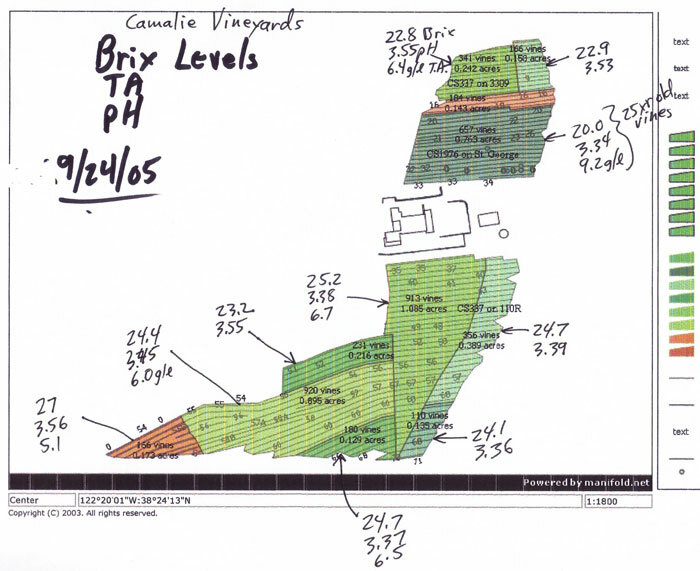 See block 5 on the Brix Map below. It is now at 25.2 Brix and should be above 26 by harvest time. Make 2 barrels of wine in a typical way (like the 2002 Wine Coop barrel WC5) with minimal intervention to adjust alcohol and acidity. Pick at 25 Brix. Make one of these barrels with the standard Saccharomyces Cerevisiae yeast and the other with the new Harmony yeast from Chr Hansen. Harmony includes two additional strains of yeast, Kluyveromyces thermotolerans and Torulaspora delbrueckii, isolated from wild yeasts which provide more "berry fruit expression, softer tanins and prolonged mouthfeel". Grapes will be picked from the riper part of the vineyard which is blocks 5-11 downhill from the house. It looks like the grapes are going to be around 25.5 Brix at harvest. Some as high as 27. Looks like we will get plenty of ripe flavors. Very little signs of shrivelling at this point which means the high Brix is due to maturity not dehydration.